Sick of hearing about the flu? Well brace yourself and brew a cup of tea, because flu season is just getting started. The good news is that it’s not too late to get a flu shot, which is the best way to protect yourself from getting sick. Let’s face it: getting jabbed in the arm (unless you get a FluMist nasal-spray vaccine) isn’t fun. But maybe it isn’t the burning pinch that’s hindering your flu shot appointment. Maybe you’re worried about something going wrong. The flu shot, like any vaccine or medication, does not come without risks. But these are small and limited to certain groups. So we spoke to two experts about flu shot safety, side effects, and possible reactions to clear things up and put your mind at ease: Dr. Tom Shimabukuro, deputy director of the CDC’s Immunization Safety Office, and Dr. Robert Jacobson, a pediatrician at the Mayo Clinic in Rochester, Minnesota. Note: This article is for informational purposes only and is not a substitute for medical advice. If you have questions or need specific advice related to your health, talk to your healthcare provider. How safe is the flu shot? The seasonal flu vaccine has a good safety record. “It’s literally designed to be given to hundreds of millions of people, and studies have been done over the years to keep it pure and safe and non-reactive,” Jacobson told BuzzFeed News. The flu vaccine isn’t recommended for babies under six months old and people who have a life-threatening allergy to an ingredient in the flu vaccine, but for most everyone else, it’s safe — including young children and pregnant women. “There’s a large body of evidence on the safety of flu vaccination in pregnancy […] and it’s important for pregnant women to get vaccinated for flu because they are at increased risk of having severe flu and complications from influenza,” Shimabukuro told BuzzFeed News. Pregnant women can also pass antibodies from the shot to the baby, which protects newborns in the first 6 months of life, when they are too young to get vaccinated themselves. Another common concern is the safety of an ingredient called thimerosal, an ethyl mercury-based preservative that’s added to some vaccines to prevent contamination with bacteria or fungi, according to the CDC. Many studies have shown that the small amounts of thimerosal in vaccines do not cause harm. However, in an abundance of caution it was removed from children’s vaccines in 2001, although it’s still found in some, but not all flu vaccines. The most common flu shot side effect is soreness and inflammation at the injection site, but this is temporary. You’re getting a sharp needle in your arm muscle, so it’s no surprise that you can feel the jab — but why is your arm sore the next day? The flu vaccine triggers your immune system to respond, but that also means you experience some localized inflammation and soreness, Jacobson explained. Other common injection site reactions include redness, swelling, and your arm feeling hot. But rest assured, these are mild and will go away on their own within a few days. These temporary injection site reactions are not the same as an allergic reaction to the vaccine, which are extremely rare but can be potentially life-threatening (more on these in a bit). The flu shot, just like every other vaccine, can also occasionally cause fainting — but this is usually triggered by pain or anxiety rather than the shot itself, according to the CDC. So make sure to sit down when you get vaccinated, because falling on the ground can hurt way more than a little pinch from the shot. You may also feel crummy for a day or two after getting vaccinated, but this isn’t the flu — it’s a normal immune response. First things first: the flu shot won’t give you the flu. But you may mistake some of the common, short-term side effects for a flu-like illness. Here’s why. When you get the flu shot, you’re being exposed to viruses that have been killed or weakened, then purified — so it can’t give you the flu, but it will allow the body to make protective antibodies. “Vaccines contain substances that are designed to stimulate the immune system and produce a response, which ultimately protects the body against the virus — but you can get some side effects,” Shimabukuro said. These include the injection site soreness we mentioned but also systematic reactions such as a fever, fatigue, and muscle aches — or fussiness or decreased appetite in children, Shimabukuro said. The FluMist nasal spray may also cause a runny nose, sore throat, or cough. Again, these are mild and typically go away in a day or two. If you experience these side effects, don’t freak out. They aren’t due to an impurity or problem with the vaccine, Jacobson said. They’re really a sign that your body is responding to the flu shot and your immune system is revving up to produce antibodies, which takes about two weeks. It’s possible to have a severe allergic reaction to the flu vaccine, but these are incredibly rare. Almost all people who get a flu shot won’t have any serious problems, according to the CDC. However, the flu vaccine, like any medication, may cause severe reactions in people who have a life-threatening allergy to the vaccine or one of its ingredients, such as gelatin (which is used as a stabilizer) or certain antibiotics (which are used to stop germs). People who have a severe allergy to the flu vaccine or one of its ingredients should not get any type of flu vaccine, according to the CDC. This does not apply to people with egg allergies — but keep reading for an explanation on this. That said, severe allergic reactions to vaccines are not as common as say, allergic reactions to tree nuts or shellfish. In fact, they are extremely rare — they occur at a rate of about 1 case per million doses of any vaccine distributed, Shimabukuro said. These tend to occur within a few minutes or hours after vaccination. Look for signs that are out of the norm, Shimabukuro said, such as difficulty breathing, swelling of the eyelids or lips, a fast heartbeat, or hives. If you think you are having a severe allergic reaction, call 911 or seek immediate medical attention. Generally, you’d know if you’re allergic because you have had reactions to vaccines (or ingredients like gelatin) in the past. However, it can be difficult to predict an allergy in someone who has never been vaccinated — and the percentage of unvaccinated children is growing in the US. If you’re concerned about vaccine allergies, talk to your doctor. The experts warn that some people may confuse normal side effects with an allergy and avoid vaccination. “You need to get an allergy test to find out if it’s a true allergy, a coincidence, or a side effect… patients shouldn’t be self-identifying as allergic,” Jacobson said. If you’ve never had a true allergic reaction to the flu shot or any other vaccine, then you don’t need to worry. People with egg allergies don’t have to skip the flu shot, and don’t even need to get the egg-free vaccine anymore. Most vaccines are grown in chicken eggs and contain a small amount of egg protein called ovalbumin, according to the CDC. This used to be a problem for people with egg allergies, and scientists even developed two egg-free options: recombinant (FluBok) and cell-based (Flucelvax) vaccines. But recently, things have changed. Generally speaking, if you are allergic to eggs than you can still safely receive the flu vaccination, Shimabukuro said, but this recommendation varies based on the severity of the allergy. New technologies have allowed manufacturers to remove enough of the egg protein in the vaccine so it can be given to egg-allergy sufferers, but it’s still present, so reactions are possible. That said, severe reactions to the flu shot in people with egg allergies can still occur, albeit very rarely, according to the CDC. These are the current recommendations: anyone with a history of egg allergies (i.e. hives or other symptoms after eating eggs) can receive any of the flu vaccines otherwise appropriate for their age and health status. People with a severe egg allergy (i.e. trouble breathing or respiratory distress after eating eggs) can also get any flu vaccine, but it must be administered in a medical setting such as a doctor’s offices or hospital, and by a health care provider who can recognize and manage allergic reactions. If you’ve had a severe, potentially life-threatening allergic reaction called anaphylaxis to the flu vaccine, regardless of which component is responsible, then you shouldn’t get a flu shot, according to the CDC. If you think you may be allergic to eggs or you are concerned about eggs in vaccines, talk to your doctor. In rare cases, fever-related seizures can occur if a child develops a high fever after vaccination. A febrile seizure is a seizure — convulsions or uncontrollable body movements — that’s associated with fevers in young children, typically between 6 months and five years of age. They are seizures with no other identifiable cause, such as epilepsy or a neurological disorder, Shimabukuro said. Febrile seizures can occur with any illness that causes a fever, such as a cold, the flu, or an ear infection. They occur in about 5% of children, said Shimabukuro, but those children aren’t at any increased risk of developing seizure disorders later in life, Shimabukuro said. While febrile seizures can be frightening, they are benign and children will usually recover quickly and have no lasting effects. Febrile seizures following flu vaccination are possible but very rare, according to the experts. In these cases, the seizure is associated with the fever that develops as a side effect to the flu shot, rather than something in the vaccine. More often, febrile seizures occur as a reaction to a fever-causing infection like the flu, Jacobson explained. What about Guillain-Barré syndrome? The cause is unknown and it’s more often associated with the flu than the shot. Another thing that often comes up when talking about flu shot safety is Guillain-Barré syndrome (GBS). “GBS is a rare neurological disorder where a person’s immune system damages the nerves, and this can cause muscle weakness and sometimes paralysis,” Shimabukuro said. While most recover, some are left with permanent nerve damage and rarely, GBS can cause death. The exact cause is unknown, but about two-thirds of patients develop symptoms within days or weeks after having a respiratory or diarrheal illness, including influenza, according to the CDC. 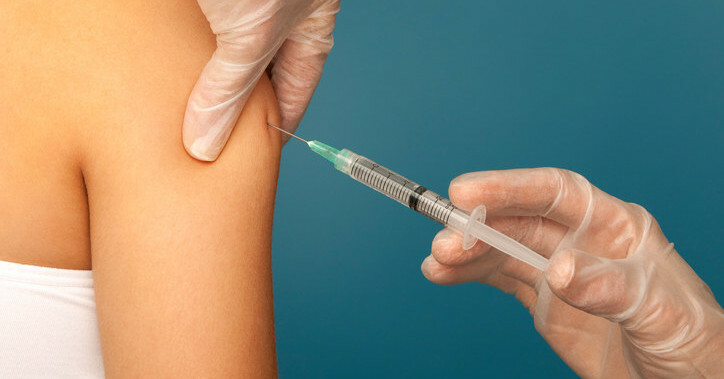 Rarely, people may develop GBS in the days or weeks after getting a flu vaccine. The risk is in the range of 1-2 cases per million doses of the flu vaccine administered, Shimabukuro said. If you have had GBS in the past, talk to your doctor before getting vaccinated. If you haven’t, don’t worry. Compared to the benefits of the flu shot, these risks are small and shouldn’t deter the average person from getting vaccinated. There is a reporting system for adverse reactions, VAERS, available to the public. “The public should be reassured that we have systems in place to rapidly detect and assess potential flu vaccine safety problems,” Shimabukuro said. The CDC and FDA use the Vaccine Adverse Event Reporting System (VAERS) to monitor early warnings of problems after vaccination, which can help determine whether further investigation is necessary. Anyone can report possible vaccine side effects or adverse reactions to VAERS — parents, patients, doctors, nurses, and caregivers. “The CDC accepts those reports regardless of the seriousness of a health event and regardless of whether we think the vaccine caused the adverse event or not,” Shimabukuro said. The reports are reviewed by experts, who look for unusual patterns that may indicate a possible safety problem. Most importantly, getting the flu is a lot riskier than getting the flu shot. The flu is dangerous and deadly, even for healthy adults — yes, including you, twenty-something who thinks you are invincible. (Check out this story of a healthy man who almost died from the flu.) It’s also more common than you probably think. “Most cases go undiagnosed — millions of people think they’ve never had flu and that they are immune or it just doesn’t happen to them,” Jacobson said. The shot isn’t 100% effective — it’s 60% at best, and it didn’t protect as well against the predominant strain (H3N2) last flu season — but that doesn’t mean you should skip it this year. Even if you still get the flu after being vaccinated, the shot can lessen the severity and shorten the course of your illness. “The flu shot should be a routine part of care… it’s like wearing a seatbelt or an air bag, it’s not perfect but it practically cuts your risk in half,” Jacobson said. If you’re thinking “I’d rather ride out the flu than get the shot,” this kind of mindset puts you and others at risk. Vaccination keeps overall levels of influenza down, which protects people who can’t get vaccinated or vulnerable groups who are more likely to develop complications or die from the flu. It keeps people out of the hospital and saves lives. Besides, ~riding out the flu~ is no easy process — it means a solid week or more of feeling miserable and lost productivity. So instead of focusing on the potential harms from the flu shot (which are rare and unlikely), think about the known dangers of getting the flu.